You’re slogging through life when you realize you haven’t made anything for months. You’re in a creative slump. Haven’t picked up your needles, a pencil, a paintbrush… whatever tools you use for your usual choice of creation. Or maybe you’ve been picking up that pencil, but nothing happens. You knit for like 5 minutes a day but just feel bored or discouraged. Something is holding you back but you have no idea what. You lost the spark for your craft. 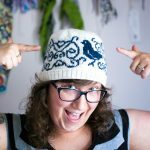 A few weeks ago, on a day where I was trying to pep-talk myself into working harder on my next knitting pattern, my sister called me to ask for a new website for her new business as a life coach. We decided to trade services instead of paying each other in money. Three weeks into working with her, I’ve gone from feeling like a creative failure to a rockstar. In our sessions, we talk about goals, what I need to do to achieve them, why I want to achieve them, what might hold me back from achieving them and what I can do about that. Because creativity is such a big part of my identity and is tied directly to my being able to successfully create more than one knitting pattern in my entire life, that’s where we have been focusing. I had been dragging my feet while trying to finish up my latest pattern. I used to write a lot but I hadn’t had an idea for a blog post in forever. And drawing and painting – lawl. What are those? I had actually given up that part of my identity in my head. I realized my problem wasn’t only with being in a creative slump when it came to knitting, it was an issue in all aspects of my creativity. The solution I decided to test out was to just start creating for the sake of creation. I figured I could make a “creativity habit” to get my brain to start thinking creatively every day. But what was the block? Why wasn’t I just doing all of the things I loved to do, like knitting, painting and writing? Our actions are often based on the stories we tell ourselves. Stories about who we are and the world around us. They can stop us from doing the things we want to do and from becoming who we want to be. By identifying these stories, we can start to notice when they’re holding us back and work to change them. What are some of the stories that hold me back? I tell myself that I’m not a productive member of society if I’m just playing around and creating things for the sake of creating. I tell myself that the only things worth doing create something useful. This is probably the reason I began crocheting and knitting in the first place. I tell myself I can no longer draw or paint, so there’s no reason to waste the money on materials. I tell myself that creating for the joy of it should only be done as a reward after doing ‘real work’. I would get up an hour early (I’m a morning person), get to my easel and paint whatever came to mind for an hour. I imagined what it would be like to stand in front of the canvas, how it would feel when I was done and got totally psyched about that feeling. Initially, I imagined I would just paint a bunch of strokes on the canvas with no end goal, mostly because I was still afraid I ‘couldn’t paint’. It was something I hadn’t done for a long time, so there was an excitement to it, but also an old comfort. I imagined I would feel like I was coming back to myself. If only masters of a craft practiced the craft… well, there would be no masters to begin with. I have been showing up for the past three weeks. I have started 5 paintings (some good, some not so good), miniatures (nerdy and creative), and bought supplies to dye yarn because playing with colors on canvas made me realize I would really love playing with colors on yarn. I started following whatever got me excited, or to steal a line from Tara Swiger, I was ‘exploring my enthusiasm’. Oh, and also, my pattern is ready for tech editing. 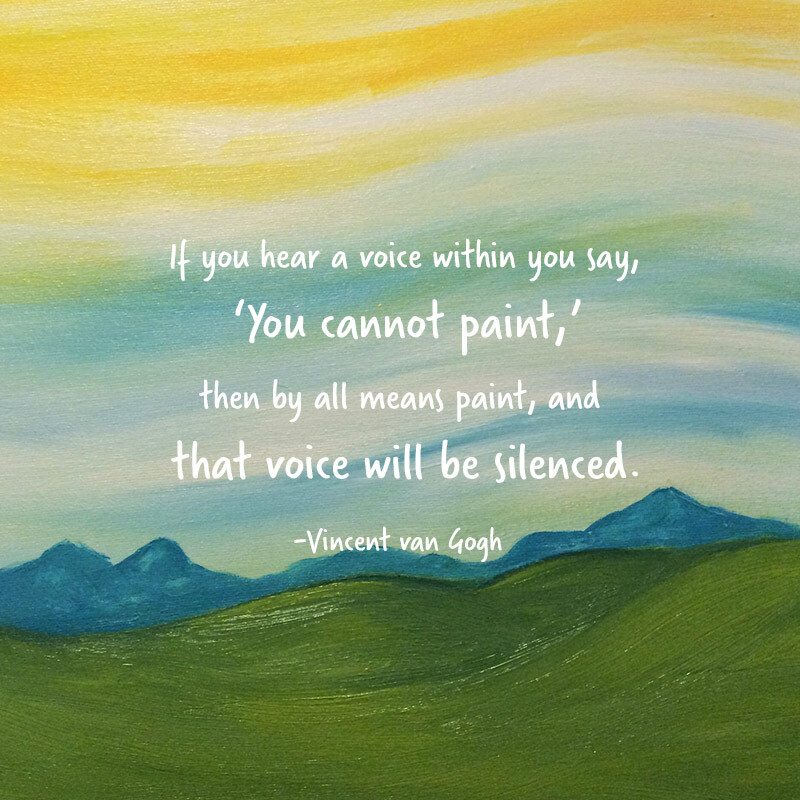 Painting every day helped me feel like I was getting back to my old creative self – the teenager who would draw and paint because she wanted to, not worried about whether she was being productive or not. And that feeling gave me a spark of energy I hadn’t had in a while. So what can you do if you’re feeling not-so-creative? What are you telling yourself either consciously or subconsciously that is stopping you from practicing your craft or being fully invested in it? Pay attention to your thoughts for a few days and see what comes up. Once you’ve identified them, come up with some counter-stories for each one. I also know that story has something to do with what I think others might think of the way I spend my time. So I add a little “eff everyone else” to the end of that story. My values, my time. Please don’t waste your time on what you think others think. They probably don’t even care. Then become aware of when you’re telling yourself these stories so you can actively counter them with your new story. Believe your new story. Repeat it often and let it become your story. Start acting, pick your craft, pick a time, go for it! While you’re working on identifying your stories and coming up with counter-stories, start imagining new or old ways you’d like to work on your creativity. Kate from A Playful Day goes on a walk with her camera to spark her creativity. If nothing comes to mind, what kind of crafts did you do as a kid or teenager because you thought it was fun? Are there crafts you know nothing about but really want to try? Give yourself permission to buy the materials and get started. Follow your enthusiasm! Imagine yourself doing this craft, where are you going to do it? How does it feel? What time of day is it? Is there something that can get in the way of practicing this craft every day and if so, what is it and how can you remove the obstacle. Work out those obstacles and get to it! But what if I’m still stuck? Hopefully you just go for it, start creating and feel super awesome about it. But if there’s something still holding you back, start to think about why you want to be creative. Is there an end-goal? Or is it more about being your true self? Really think about it and imagine yourself where you want to be. Get excited about being there and your actions will follow. …If it makes you happy and fulfilled that’s all that matters…..
LOVE LOVE LOVE this blog Mandybee!! You are a total rock star and now you are paying it forward to help others tap into their greatness. And the ripple begins……..
Just read this today. Great blog. You’re so good at conveying ideas through written word. I wonder if you realize that… ? I’m so happy to see you painting again. And I’m amazed at your outlook on life. Your happiness makes me happy. I’m glad I can help! A positive internal dialog can do so much to change how you approach both good and bad situations. People don’t have to feel like they’re just being swept up with no control over the things going on around them. We may not have control over the external, but we have control over how we react. It seems impossible when you first hear it, but the more you practice and become aware of your reactions and feelings, the easier it gets to control them and realize the things that are happening around you don’t have to change who you are if you don’t want them to. Previous PostPrevious Swatch for gauge… or else! Next PostNext Nice Cuppa pattern now available!